For convenience, I've broken this region into its two quite distinct subregions, the Northern and Southern Rhône. The two are quite different in character, and so this sort of division makes sense. Driving north from Valence? I strongly recommend that you leave the autoroute and take the N86, which follows the course of the sleepy Rhône river. There's a continuous swathe of vineyards following the contours of the hills on the left of the road for some 40 miles, with the appellations of St Peray, Cornas, St Joseph, Condrieu and Côte Rôtie merging into each other. Over on the right bank of the river, the land is flatter and there's just one large hill, that of Hermitage, with the lower land around it home to Crozes Hermitage. Some of the vineyards here are spectacular, and the many of the wines no less so. It's predominantly red wine country, and Syrah is the grape here. Its expression varies both with the appellation and the producer, reaching different but similarly exalted heights in Côte Rôtie and Hermitage, with the best examples from Cornas lagging not far behind. White wines are less common but can be brilliant, with the peaks coming in the form of Condrieu (from Viognier) and Hermitage (Rousanne and Marsanne star). 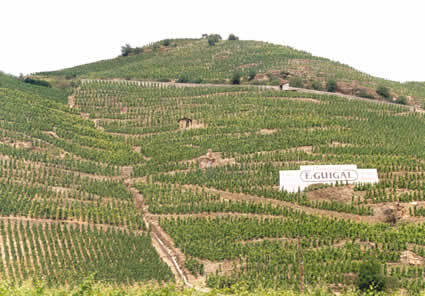 Vineyard area of the top appellations is restricted, and only small quantities of wine are made, making availability a problem. Soft and mature, with some herbal elements and high acidity. It is mature and expressive, but has probably seen better days. Good but not stunning. The Southern Rhône is quite different from the North. The climate is noticeably warmer, and the vineyards are predominantly flatter. They also occupy a much larger area. The most famous appellation is Châteauneuf du Pape, north of the famous papal town of Avignon. It is best known for its spicy, herby, alcoholic red wines that are made from a total of thirteen permitted varieties, most significantly Grenache, Syrah and Mourvèdre. Good examples are substantial wines that repay cellaring, but there are plenty of dull ones still to be found -- none are cheap. And although people often think of red Châteauneuf as a 'powerful' wine, it is often quite light in colour when compared with the Syrah-based wines from the Northern Rhone. Quite similar in style are the wines from villages such as Gigondas, Rasteau, Vacqueyras. Since receiving its own 'appellation contrôlée' status in 1971, Gigondas has proved to be a worthy competitor to its better known neighbour, Châteauneuf du Pape. Although some white and rosé is made here, this region is really all about solid, chunky red wines, predominantly from the Grenache grape but also with a bit of Syrah and Mourvèdre in the blend. Quality is improving with each vintage, and the best examples reward long cellaring. Finally, Côtes du Rhone is a generic appellation used as a catch-all to label the vast amount of largely inexpensive wine made here. Quality varies dramatically, but most of it is inexpensive but reliable plonkish red made mainly from the Grenache grape. 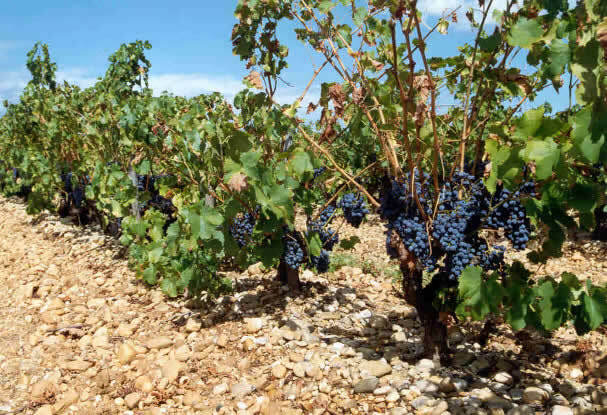 Some 16 villages are entitled to use the Côtes du Rhône-Villages appellation: the peppery, spicy, rustic reds from these communes are often more substantial wines that represent excellent value for money.